The Weeks Bay Watershed encompasses approximately 130,000 acres (203 square miles) located in southwest Baldwin County. Weeks Bay is a shallow approximate 1,700-acre sub-estuary of Mobile Bay. The watershed includes the Fish River and Magnolia River drainage basins, as well as some small coastal streams such as Weeks Branch that enter Weeks Bay directly. 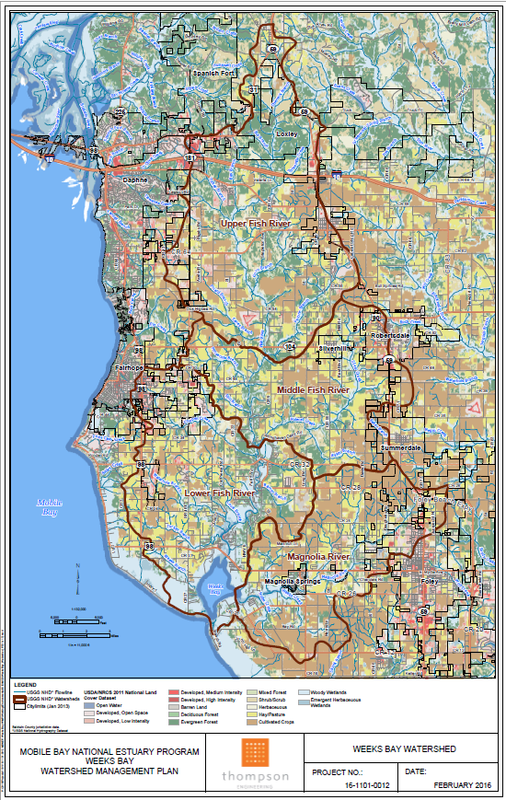 The watershed encompasses an area approximately 27 miles long and 12 miles wide. Portions of nine municipalities lie within the Weeks Bay Watershed – Fairhope, Daphne, Spanish Fort, Loxley, Silverhill, Robertsdale, Summerdale, Foley, and Magnolia Springs. The Fish River drainage basin begins near the town of Stapleton and flows in a southerly direction. The eastern boundary of the Fish River basin is near U.S. Highway 59 and the western boundary is near U.S. Highway 31 (Stapleton to Spanish Fort), thence southward near Alabama Highway 104 (Spanish Fort to Fairhope), thence southward near U.S. Highway 98 to Mobile Bay. The Magnolia River drainage basin has its headwaters near Summerdale and flows in a southwestward direction to Weeks Bay. The Upper Fish River basin covers approximately 42,000 acres. The dominant land use/cover is agriculture (39%) consisting of row crops and pasture, followed by forest land (35%), urban development (15%), wetlands (11%). The eastern part of the Upper Fish River basin includes portions of the Loxley, and the western part includes portions of Spanish Fort and Daphne. Commercial and residential development is occurring along the major transportation corridors of Interstate 10, U.S. Highways 31 and 90, Alabama Highways 59 and 181, and County Road 64. The Middle Fish River basin covers approximately 27,000 acres. The dominant land use/cover is agriculture (58%) both row crops and pasture. The forested land comprises about 20% of the basin and wetlands cover about 12%. Urban development makes up about 10%. 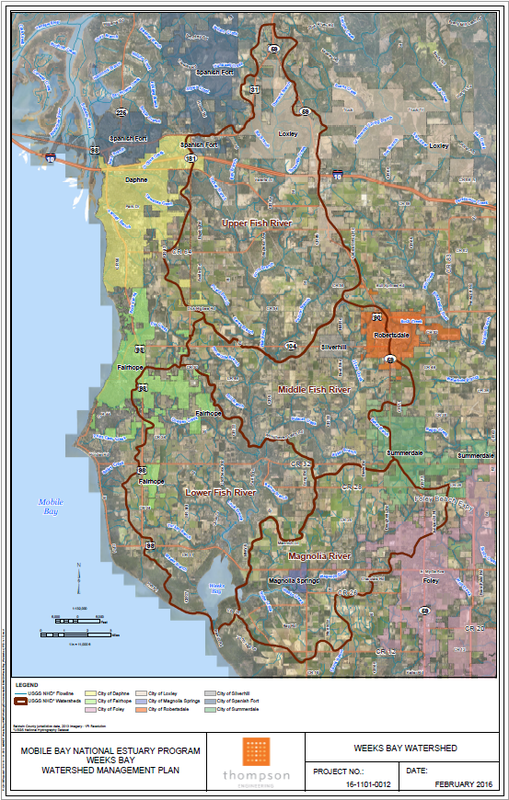 The eastern portion of the Middle Fish River watershed includes all or parts of Robertsdale, Summerdale, and Silverhill, and the western part of the basin includes a small portion of Fairhope. Commercial and residential development is occurring along Alabama Highways 59, 104, and 181. The Lower Fish River basin covers approximately 34,500 acres. Land use/cover attributed to row crops and pasture is 43%. Wetlands and open water cover about 26%. Forest areas account for about 16%, with developed/urban use with 15%. The western portion of the Lower Fish River basin includes portions of Fairhope. Commercial and residential development is occurring on U.S. Highway 98, Alabama Highway 181, and numerous county roads. The Magnolia River basin covers approximately 26,000 acres. Land use/cover attributed to row crops and pasture is 64%. Wetlands and open water cover about 14%. Developed/urban use accounts for about 13%, and forest areas account for about 9%. The Magnolia River basin includes portions of Summerdale and Foley and all of Magnolia Springs. Commercial and residential development is occurring in U.S. Highway 98, Alabama Highway 59, and numerous county roads. Fish River and Magnolia River feed into Weeks Bay, that was established as an Outstanding National Resource Water (ONRW) by the ADEM in 1992. Both Middle and Lower reaches of Fish River are classified by ADEM as Swimming and Whole Body Contact and Fish and Wildlife. Polecat Creek from its headwaters to the confluence with the Middle Fish is classified Swimming and Whole Body Contact and Fish and Wildlife. Cowpen Creek, Waterhole Branch, and Turkey Branch are classified as Swimming and Whole Body Contact and Fish and Wildlife from headwaters to the confluence with Lower Fish River. Other named and unnamed tributaries are classified Fish and Wildlife only. The entire length of Fish River (30 miles) and Magnolia River (12.4 miles) is included on the Clean Water Act (CWA) §303d (2014) for mercury contamination. 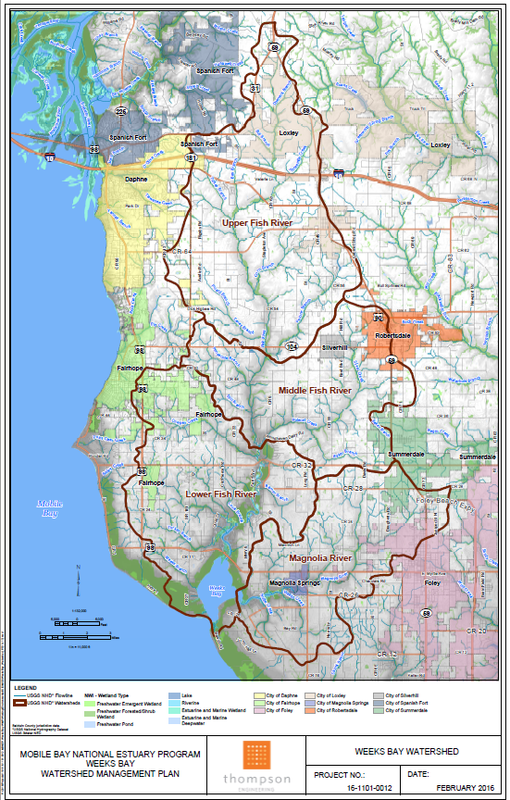 Other mercury impaired streams include Polecat Creek (7.9 miles) in the Middle Fish basin and Cowpen Creek (7.1 miles) in the Lower Fish basin. The presumed source is the atmospheric deposition. Baker Branch (6.2 miles) is included on the CWA §303 (2014) list for Organic Enrichment and Low Dissolved Oxygen. The presumed source is grazing and agriculture activities. An approved TMDL for Pathogens (2013) exists for the entire length of Fish River. Sources of pathogens as determined by the TMDL are nonpoint sources transported by stormwater runoff in the Fish River. Areas within the boundaries of permitted municipal separate stormwater sewer systems managed by the City of Fairhope and Baldwin County discharge into Cowpen Creek, Waterhole Branch, and Turkey Branch. Magnolia River was listed as an Outstanding Alabama Water in 2009 by ADEM, with water use classification of Swimming and Whole Body Contact and Fish and Wildlife for the approximate 12.5-mile long stream. Permanent and part-year residential dwelling exists along the shorelines of Weeks Bay Watershed. Recreational fishing and swimming are a common use throughout the watershed. Paddling is common in the northern reaches of the Middle Fish River basin with power boating occurring in the southern reaches. In the Lower Fish River and Magnolia River basins including Weeks Bay, swimming, recreational fishing, paddling, water skiing and power boating are common. Limited (by statute) commercial crabbing is allowed in Weeks Bay. No other commercial fishing is allowed. Six public access sites are located in the Middle and Lower Fish River basin. One public access site is located on the Magnolia River and one public access site is available at the mouth of Weeks Bay. Wildlife watching and photography are popular human uses of area water resources. The Weeks Bay National Estuarine Research Reserve (WBNERR) offers a visitors center with trails and boardwalks through ecologically sensitive wetland, bog and salt marsh habitats that would typically be unavailable due to limited public access to most areas. Public lands (3,412 acres) connected by state-owned, tidally-affected water bottoms located in the Lower Fish River basin are included in the federally-recognized protected area, the WBNERR. Habitats within WBNERR support a large variety of aquatic, benthic, wetland and upland plants and wildlife. Successful completion of the research, education, and land conservation mission of WBNERR is predicated on the health of Weeks Bay, Fish River, Magnolia River, and associated habitats. Preservation and restoration of ecologically sensitive habitats like salt marsh, pitcher plant bogs, and pine savannah are ongoing on WBNERR lands. The USFWS website documents the following threatened, endangered, and candidate species for Baldwin County in habitats such as found in the Weeks Bay Watershed: West Indian manatee (Trichechus manatus), Alabama red-bellied turtle (Pseudemys alabamensis), American bald eagle (Haliaeetus leucocephalus), wood stork (Mycteria americana), Gulf species of Atlantic sturgeon (Acipenser oxyrinchus desotoi), eastern indigo snake (Drymarchon corais couperi), and gopher tortoise (Gopherus polyphemus). Others species of concern listed in Alabama Comprehensive Wildlife Conservation Strategy include the diamondback terrapin (Malaclemys terrapin pileata) and the alligator snapping turtle (Macroclemys temminckii). Extensive ongoing water quality monitoring efforts by WBNERR, ADEM, and trained volunteers occurs at several locations in Weeks Bay Watershed.